Except for the inventive cocktails we found at some Athens rooftop bars, the Greeks don’t really drink a lot of mixed beverages. It seems they are purists when it comes to alcohol. The drinks they do enjoy have been around for hundreds if not thousands of years. 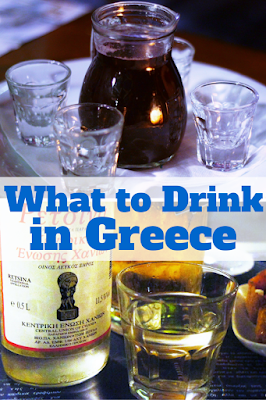 Here are five traditional Greek alcoholic beverages to drink while traveling in Greece. Ouzo is a Greek liquor that tastes like black licorice, the flavor of which comes from anise. Ouzo is made with grapes distilled in copper stills. Anise is added, as well as other flavorings sometimes like fennel, clove, or cinnamon. Ouzo is flavorful but very strong. Some drink it straight, but others like to mix it with cold water or ice. For me, the best way to drink ouzo is with ice. When water or ice mixes with ouzo, a chemical reaction occurs and the ouzo turns from clear to cloudy white. Ouzo can only be named such if it is made in Greece, similar to how only sparkling wine from the Champagne region of France can be called champagne. Wine is the most ancient Greek alcohol. According to Greek mythology wine started in Greece when Dionysus, the half-man half-god son of Zeus, lived in the mountains and learned the wine making process. Dionysus brought the art of wine making to humans when he taught Icarus, the king of Athens, how to make wine. Greece has a number of wine grapes unique to Greece which are rarely if ever used outside of the country. Most of these unique grapes are white grapes, like Assyrtiko and Vidiano, but there are also red grapes like Kotsifali and Mandilaria. For more about Greek wine, read Wine of the Gods: Discovering Greek Wine in Crete. Tsipouro is a liquor produced only in Greece. It is similar to Italian grappa as it is a distilled spirit made using the left over must from pressing wine. Tsipouro can have a very harsh flavor, though some are smoother than others. Tsipouro is most commonly enjoyed as an after-dinner aperitif and is served in a shot glass. Tsikoudia, also known as raki, is pretty much the same as tsipouro, except raki is unique to the Greek island of Crete. If you’re anywhere else in Greece, you order tsipouro, though some places also have raki on hand, but if you’re in Crete you order raki or tsikoudia. The aroma of raki is stronger than tsipouro. My personal experience was raki usually tasted better and was smoother than tsipouro. Retsina is a wine product also unique to Greece. The base of this Greek alcohol is white wine or rosé, but it has an additional flavor of pine resin. This is an odd combination that can be off-putting for those not used to the flavor profile, but the Greeks have been drinking retsina for thousands of years. The tradition started because the Greek winemakers lacked airtight containers, so covered their wine jugs with pine pitch. The pine pitch both sealed the bottles from incoming oxygen and also added the signature flavor. While alcoholic beverage choices aren’t as prolific in Greece as in other countries, Greece has alcohols all its own and ones they have been making for thousands of years. It’s like history in a glass.